And they will continue becoming even more blurred in the future. As the young, developing craft distilling movement matures and begins offering longer-aged whiskeys, they will compete with the established distillers’ products. 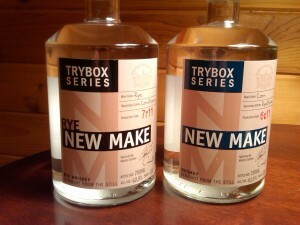 On the flip side, the established distillers are increasingly offering younger, and as is the case with Heaven Hill’s “TryBox Series” (shown in the picture), sometimes even unaged product for sale. In fact, distillers on both sides of the pond are selling unaged spirit. Craft distillers comprise a rapidly growing, but still relatively low-production, market. I don’t think the large, established distillers have anything to worry about–yet. But they would be foolish to not pay attention. Just take a look at the American craft beer market and you will see where craft distilling is heading. According to a recent Brewers Association press release, overall beer consumption is down, but the craft beer market continues to grow and capture market share. The large brewers who made relatively bland pilsner-style beer are now making beer with more flavor–or forming alliances with craft brewers to compete with them.